MrRingo Sportsbook has had their gaming license revoked by both the Malta Gaming Authority (MGA) and the Curacao eGaming Division. SBR Forum posters reported slow payouts and poor service at the online sportsbook. MrRingo has been downgraded to F and has been listed on the scam sportsbook blacklist. In the event that MrRingo resolves its licensing issues, the sportsbook will remain on the blacklist until players confirm receiving payment in full. Below is a message from the Curacao eGaming License Division, which players see when they load MrRingo. 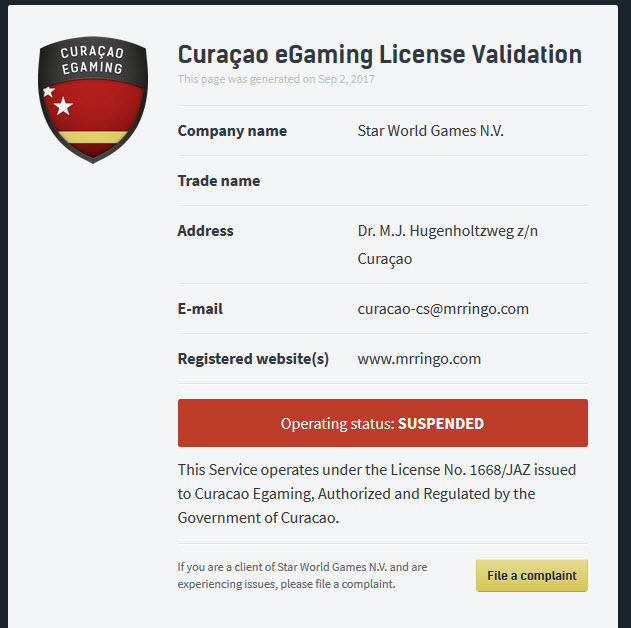 Players can file a complaint with the Curacao eGaming from this link.